I've been a Cortina fan ever since I started reading UK Ford magazines... and then visiting the Classic Ford show at Santa Pod in 2009 pretty much sealed my obsession. I picked up an interesting car on eBay from Placerville, CA. Honestly, I really didn't know much about Cortinas besides the basics, but I've been educating myself as quickly as possible. It is a Lagoon Blue 1500 Deluxe that is registered as a 1965... after a little looking at the ID Tag, I realize it is actually a 1966. Somebody misread the (FU) Year/Month as (EU) I suppose. Some parts of the car are in great shape, and some are in really bad shape. It has rust work to be done, but oddly enough the rust really seems to be isolated to the common Cortina spots. The boot, bonnet, doors, floorpans, and inner wings are in good shape. The bad spots are the wing bottoms, a small portion of the sills, the rear fender inners and outers, the headlights, and just a bit of damage in the strut tops. The car came with Lotus springs, shocks and wheels, otherwise is quite standard. Supposedly the engine has about 10 miles on it after a rebuild, and the cleanliness of the engine bay suggest it to be true. My plans are a rolling restoration of sorts, fixing the bodywork first. The right side door has a big dent, so I'll be replacing the door skin then moving toward the rust spots one at a time. As I go, I'll do a quick bit of DIY paintwork, saving the big dollar respray for the finished product. Hopefully nobody is offended by my plans of non-originality, but I plan on changing the color to a bolder shade of non-metallic blue with a black or white lotus-style stripe. The interior is a little rough, so I'll probably change it from Aqua to black. For wheels, I'd like to go with something from the 70's euro ford selections, but for now I'd like to refinish the Lotus steels in silver. I plan on keeping all the chrome and brightwork intact since that is what gives the car so much character. Drivetrain wise... I'm a bit undecided. I'll probably keep the non-crossflow going until the car is better looking and then I'll revisit that. I'd like a more modern Ford powerplant, but I don't want to hack the car to pieces either. If anybody recognizes this car or has any information on previous history, please let me know. On a semi-related note, I've been into euro Fords for quite a while. I also would have liked a 78-80 Fiesta, but the post-smog status would have driven me nuts with the things I'd want to do to the car. 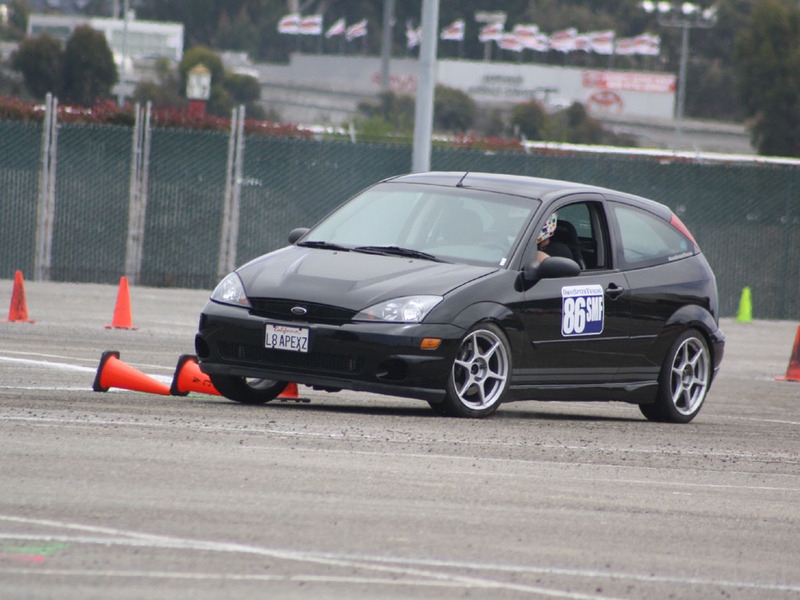 My other Ford is a 2000 Focus with all sorts of go-fast goodies, including a supercharger, Quaife, KW coilovers, and a list two-miles long. It used to be a daily driver, but now has become a weekend toy. Beyond seeing your car on Ebay, I think, I don't know much about it. As the previous owner of 2 302 V8 MK1s I say go for it and enjoy it how you see fit. It is your car after all. There are many engines that will be quite comfortable under that hood so do what ever you are capable of and enjoy it. Thanks for the welcome and tips! I just ordered a doorskin from the Mk1 Cortina OC, so we'll see how that goes. I picked up a junk (rusty) pair of doors from somebody local, mainly for the left side window glass that is cracked on mine. They're pretty rotten otherwise. I'm hoping my door frame isn't too tweaked by that large dent, but the door still opens well, so I think it'll spring back once the door skin is cut off. Congratulations, you have a true WORLD classic! !